THE NELSON Mandela Centre of Memory in Houghton witnessed a crucial development in the history of South Africa, with the handover of the digitized audio archive from the Rivonia Trial of 1964. Through the painstaking endeavours of French researcher and sound engineer, Henri Chamoux and the French National Audiovisual Institute [INA], the restoration of the sound archive has been completed and is now available to be heard by everybody in South Africa and beyond her borders. Chamoux, from the Laboratory of Historical Research Rhone-Alpes [LARHRA] was able to accomplish this most commendable of feats through his epoch-making invention named the Archeophone – with which he recorded some 250 hours of audio from the Apartheid-era event which played out between the years, 1963 to 1964. 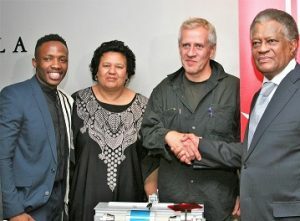 French engineer, Henri Chamoux posed with archivist, Dumisani Basina (left) and Max and Eleanor Sisulu at the Nelson Mandela Foundation, on the occasion of the official handover of the digitized Rivonia Trial audio archive. All images Jacob MAWELA. The original audio from the trial proceedings had been recorded on 591Dictabelts kept at the National Archives and Records Service of South Africa [NARSSA]. Consequently rendered an obsolete audio recording format, countless Dictabelt recordings of invaluable history and heritage have fallen through the cracks – up until Chamoux creation came to posterity’s rescue! Thus, a combination of two technological aspects entail the preservation of that juncture of South Africa’s Struggle for freedom from Apartheid oppression – the Dictabelt and the Archeophone! The Dictabelt is a soft vinyl cylinder stretched around two rollers rotated in a special reading device, and said to be one of the last survivors of what is known as the phonograph cylinder. This sound medium was commonly used in the US and elsewhere between 1947 and the 70’s. Among its most famous applications, the flexible cylinder included recordings of President John Fitzgerald Kennedy’s telephone and those of author, Agatha Christies’ voice, dictating in full, one of her novels. Whilst information gleaned on the internet regarding the Archeophone revealed it as the only modern device able to play all formats of wax or celluloid cylinders produced between as far back as 1888 and 1929. Sound recordings that old are invariably fragile and wear very quickly if read on vintage phonographs. The Archeophone, which allows for the transcription of the cylinders on CD, is presently utilized by the largest archives which preserve such media in the world: The Library of Congress, Bibliotheque National de France, Edison National Historic Site, as well as other private institutions and collections. The South African and French collaboration had its genesis back in 2012 when NARSSA approached the French Institute of South Africa [IFAS] and INA to start a process of digitisation and restoration of the entire Rivonia Trial sound archive. That was during the time INA was offering NARSSA sound technicians ongoing training geared towards South Africans having their own agency over thousands of Dictabelts dating from the Apartheid period, which are yet to be restored and studied. The organisational reasoning was for the treasure trove of memory to not remain hidden away. So that, to that end, efforts to regain access to historic records remains a process which revives the universal impetus of archives for research, art, culture, the law and beyond! The Rivonia Trial, where Nelson Mandela, Walter Sisulu, Ahmed Kathrada, Govan Mbeki, Lionel Bernstein, Raymond Mhlaba, James Kantor, Elias Motsoaledi, Andrew Mlangeni and Denis Goldberg were convicted of a coup attempt and subsequently sentenced to life imprisonment – did not produce a hearing record, meaning that the exchanges which transpired in court were not stenographed, but were instead recorded continuously on Dictabelts. In December 2006, they were registered in UNESCO’s Memory of the World Register. Having invented the Archeophone in 1998, Chamoux had initially intended it for the reading of old phonographic cylinders of wax or celluloid – but with the device, has instead, been able to read and digitize, between 2014 and 2016, all the Dictabelts of the Rivonia Trial. Chamoux took a little over 15 months to edit and digitize 230 hours of recording in a process which entailed daily morning to afternoon of continuous recording done by two correctly relayed devices. He is quoted as offering that his recognized competence in the safeguarding of wax cylinders and more widely in the recovery of hard-to-read sound media, allowed for the conclusion of a market between INA and LARHRA in November 2014 – in order to digitize the Dictabelts of the Rivonia Trial to the best of technical conditions. At INA, Brice Amoroux co-ordinated the project, while Patrick Louvet, the institute’s expert on rare sound media, led the quality control of digitized production. Explaining how he was able to deliver the task entrusted to him, Chamoux went to great technical lengths to let people in on what it took. If it were possible to re-read some Dictabelts correctly with old machines, he suggested, the reliability for the reading of numerous or sensitive archives would be compromised. He said that after the realization of a first prototype mandrel Dictabelt in 2007, he went on to develop a chuck with adjustable diameter designed to allow for the reading of Dictabelts on the Archeophone, in 2013. The latter method allowed for the tension exerted by the jaws of the mandrel to be applied over an entire surface of the Dictabelt, effectively reducing the negative impact of folds, without mechanical crushing or deformation of the support and without heating in order to soften or relax the vinyl – thus rendering the document not to be damaged by reading. He went on to give a glimpse that as a first listener of all the recordings, he lived every minute of the trial – or at least, what’s left of it. Listening to the mainly English language dialogues, Chamoux kept on checking the slow progress of the reading, repeating the process where necessary – until the best result was obtained. The sound engineer described the deep and calm voice of presiding Judge Quartus de Wet, whom he said expressed very little – converse to the voice of prosecutor, Advocate General Percy Yutar, who is heard in the recordings pending endless interrogations, with a systematically exaggerated chromatic rise at the end of each question. “In fact, the emotion is everywhere in this hearing, with each new voice discovered, especially those of the many second-rate witnesses: some are absolutely terrorized. But by listening to the voices of the main defendants of this trial, their patient responses, their solemn declarations, the support they give each other, we really feel how, together, these voices have turned this trial into a platform for equality. In particular, we could list the many occurrences of a sentence such as, “I am not prepared to disclose any of my friends”, pronounced by Ahmed Kathrada, by Walter Sisulu and by others, to prove once again, with the power of the voices themselves this time, the strength and value of exceptional characters”, stated Chamoux, in breaking down the process he had to manoeuvre through. The Frenchman went on to point out that the records do not offer a final verdict – further stating the Dictabelts of the trial were not sheltered in their eight albums, in a strict chronological order, thus rendering the entire collection to be more like a folder added to pieces to be loaded. “We will not hear either the opening session: neither, “Oyez! Oyez!” Nor any other interjection to evoke any solemnity, but instead, microphone tests, ambient noises, sounds of folding seats or swinging doors, sounds of chairs when everyone gets up. Officially, the trial begins on November 26, 1963, but the earliest recording dates from the 29th and begins with an ongoing debate about the possibility of setting aside the indictment process”, he reported on shortcomings of the process. Yet Chamoux assured that, in spite of the presence of cracklings and other alterations familiar with vinyl listeners, the entire collection was already perfectly audible – even though there was still room to perfect it. French National Audiovisual Institute technician, Quentin Geffroy explained the process of digitizing the Rivonia Trial audio archives at a handover ceremony at the Nelson Mandela Foundation. He also acknowledged the role played by a crucial partner in the project, INA, who were responsible for audio restorations. 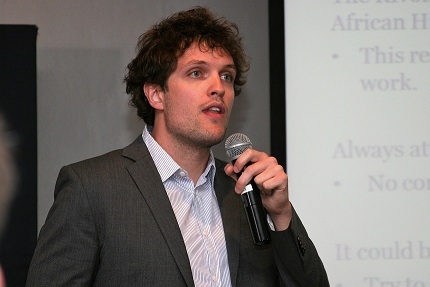 At the Nelson Mandela Center of Memory, Quentin Geffroy, a member of the French institute’s team which toiled under Vincent Fromont, also got to share with invitees on the technical rigours they had to juggle through – whilst wading through English, Afrikaans, Xhosa and Zulu sound recordings. Other challenges encountered pending the restoration process included common accidents such as the weakening or even disappearance of the signal caused by a bad follow-up by the tip of too narrow or damaged furrows. Some unrestored sound clips include circumstances of a speech by Nelson Mandela delivered in April 20, 1964. The last remarks in the introduction by defence attorney, Bram Fischer; a few words by Madiba interrupted by an intervention by Advocate General Percy Yutar; the response of Judge Quartus de Wet; the beginning of the testimony of Nelson Mandela from the dock and Ahmed Kathrada talking about his travels in Europe and his visit to the Auschwitz Camp, etc. Although the two surviving members of the accused at the trial, viz, Andrew Mlangeni and Dennis Goldberg weren’t present at the foundation to witness the momentous presentation of the sound archive, in the midst was a member of whom others are wont to refer to as a Struggle family, erstwhile South Africa’s Speaker of Parliament, Max Sisulu. There with his wife, noted author, Eleanor, Sisulu, the progeny of one of the Rivonia trialists, Walter, remarked at the conclusion of proceedings: “Lest we forget!” For her part, in a sound bite which would justifiably be on behalf of most countrymen, thanked everybody involved in the preservation of a heritage which has the capacity to negotiate the future by remembering the past!